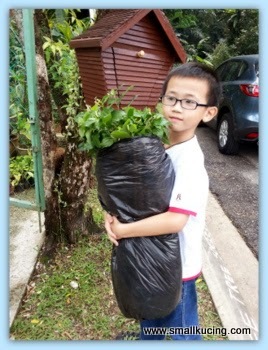 Saw the announcement by Free Tree Society Kuala Lumpur that they are having giveaway for World Planting Day, last Saturday. 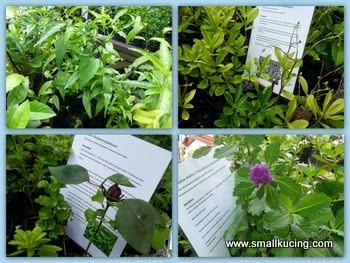 We have loads of Daun Kadok, Indian Borage and Pegaga. Messaged them if they need any and they replied that they welcome Daun Kadok and Indian Borage. Armed with that, I went there for the first time. Wow....they are sure giving out loads of tree and herbs plants for free. Each person may take one plant home. Oh my Kucing! There were Durian trees too! Nah! We didn't take that. Instead we took rose and Cuban Oregano. They were giving out tadpoles and little fishes too. 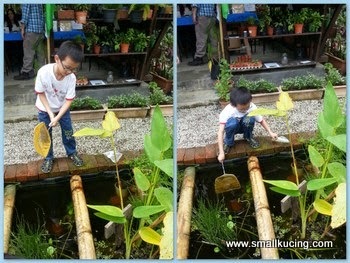 I had great time trying to catch some fishes but all I caught were tadpoles. A pretty girl girl helped me to catch a little fish. The fish that the girl girl helped me to catch. 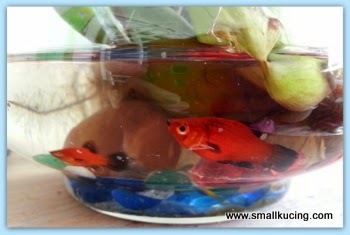 Mamarazzi said put the tadpoles at a shaded area in the car porch la. Soon they will become frogs. Well done , kucing!! That's the way ... love nature! This is awesome! 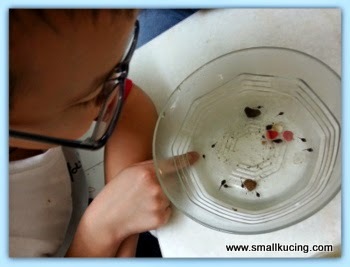 I hope you show us when the tadpoles become fish!! Why didn't you get a Durian plant? I can remember gathering tad poles when I was a kid. We called them poly wogs. Not sure why. What pretty girl? No photo kah? Wahhhh...so nice, can get free one. Dunno of any place here that does that. No need to bring anything to exchange. Can just go there empty hand to get a plant. It's just that we happen to have excess of Indian Borage and Daun Kadok plants. If wanna throwaway, sayang. So asked them if they wanna it or not. Thanks for the link. Will check their fb for their next giveaway. That is wonderful...to share plants. How nice if we can have one here in Ipoh. I am sure you had a fun time there. Maybe your area can organise one. No no...this is not a plant exchange. No need to bring plants there also can get a plant if you wish. 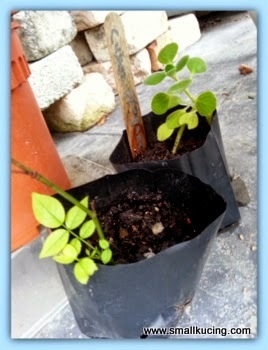 oooh, Mamarazzi took rose and cuban oregano.. the oregano is a kind of herbs and Mamarazzi can use it in cooking?? ooooh, oregano and rosemary roast chicken with grilled veggies?? sound yummy yummy..
yes. according to them this oregana can be use for cooking. haha, see the little fish also tertarik by lenglui only.. Small Kucing only caught a few tadpoles but lenglui jeh jeh got him a little fish!! 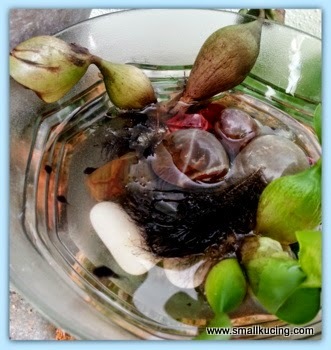 errrr, really going to let the tadpoles grow into frogs inside there?? hmmm, later all jumping inside the house and scare Mamarazzi pulak.. dunno lah, Uncle SK finds frogs very yucky leh~~ Small Kucing likes them ke?? Fantastic way of exchanging plants. Must check out too. Very interesting. So Kucing family gave some plants and took back a few too? So how are the tadpoles? Showing the legs already?? So fun this. Plant exchange is better than buying from nursery coz you know 'normal' people can plant them. LOL...not an exchange but anyone can take a plant home during their giveaway even without bringing a plant. free plants and trees are a wonderful idea! That's nice! Our earth need more greens. Bestnya got event like this. Sure be interesting and fun.